The meme of the weekend was a TechCrunch report that Facebook is working on its own phone. Facebook quickly distributed a detailed denial of any phone-building activity, trying to cut the story at the knees by stating it’s not building a phone, but it is working on adding support for Facebook Connect into mobile operating systems and building a broadly accessible HTML5 version of its site. But the idea clearly has staying power, and why not? It’s a good one. Facebook should start working outside its core competency very soon to do things like make phones. Creating a better mobile experience would significantly help Facebook in its competitive fight against Google (s GOOG). Right now, Google might be inept at social, but it’s clearly trying to do better, and it will. Google’s best social assets are the Gmail platform and the rapidly adopted Android mobile OS. A Facebook phone, even one built on Android, would help erase some of the very real advantage Android gives Google through the on-phone address book and the ability to help shape other people’s mobile apps. Facebook might be an emerging technology juggernaut, but it’s narrowly focused on building a social networking platform. Meanwhile, Google often releases products that extend its influence in unexpected, non-core and seemingly off-topic ways: Google Maps and Google Earth, Android, Chrome and Chrome OS, regional fiber deployments, even the Lunar X Prize for moon travel. While search advertising is still where Google’s big bucks come from, it’s these other projects that make the company pervasive and keep it innovative. When Google was six years old, as Facebook is now, it launched Gmail. The most experimental and non-core thing Facebook has done recently is to essentially rip off its former employees’ startup Quora with the launch of Facebook Questions. That Facebook says it’s not “building” a phone doesn’t mean all that much. The Facebook phone story has a strong déjà vu factor, given that Google recently made its own phone to demonstrate the capabilities of Android. That project, the Nexus One, has already been aborted, with Google saying the example the phone had set has been absorbed by other handset makers. Google, of course, didn’t actually construct its own phone; it partnered with HTC. Similarly, Facebook could easily customize and brand a phone without “building” it. It would, of course, try to improve on some of the pitfalls of the Nexus One, like direct sales, customer service and competing against carrier and handset partners. Obviously, the idea of embedding Facebook more deeply into phones makes tons of sense. It’s already happening. I get a thrill every time I get a call on my Droid Incredible from a Facebook friend I’ve never talked on the phone with, and see his or her name and picture pop up on my screen when the call comes in, thanks to Facebook-Android integration. Facebook already has 150 million active mobile users for a range of apps, partnerships and mobile web offerings (and they are twice as active as non-mobile users), but the company’s mobile offerings almost always lag far behind the development of its main website and are long overdue for significant refreshes. A dynamically updated, global, mobile address book that has everyone’s number I rightfully have access to, but prioritizes those I actually talk to often. Facebook already has filtering capability like this powering its news feed. The concept of deleting numbers (unless they’re for an ex you really shouldn’t call when drunk) or updating contact info should disappear. A display of whether contacts are available based on information from interpreting their IM status, their location, whether or not they’re on a call, scheduled meetings, and other integrated calendar and real-time factors. Ways for other mobile developers to easily hook into Facebook to make them socially relevant and share activity with Facebook. This could include activity stream information as well as integrated Facebook Credits payments, Facebook Places check-ins and other actionable information. 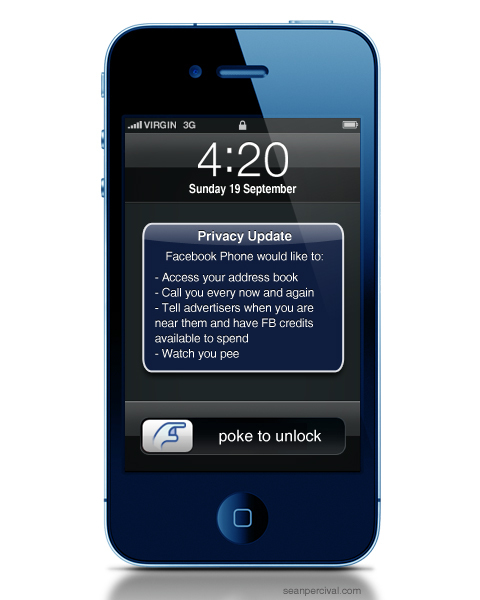 It would also be a great way for Facebook to improve and extend its advertising. That’s just my quick stab at brainstorming features; I’m sure other people could dream up many more imaginative and useful concepts. Maybe the idea of building a social phone is too obvious — indeed, it’s already been done by INQ with much success. Many of these features could be implemented with improved Facebook integration into other people’s mobile operating systems. Facebook should probably think bigger and more radical. For more discussion about the future of mobile, you should check out GigaOM’s third annual Mobilize conference in San Francisco on Sept. 30. There is nothing impossible in this tech world. Because we are saying lots of things shaping with wonders. Today I had read about a person, he is from China did his studies in Australia. Wonder about this person is that he had created a Twitter app, an instant version of Bing last April which is similar to the instant search results that Google introduced recently! In a fairly recent interview Zuckerberg commented on the phone number being an endangered species. Foreshadowing to a Facebook plan to release a phone? Perhaps. But in my opinion, it is more likely that they’d partner with a manufacturer and cellular network much like Apple did with AT&T. Facebook could be integrated at the core of the phone and offer unlimited calling to friends. The downside of course would be everyone expanding their social networks to include business contacts to cash in on the free calling. But, people would flock to it, and being integrating with the mobile industry, it would succeed where skype and VoIP fails. I second your opinion and more over I ca expect Free Call to Facebook friends feature if they rolled out.. Imagine you have a Facebook phone and you can call for free to your Facebook friends on their Facebook Phone or if they online, you can get instant update via online chat..!! If not phone, Facebook should come with a dedicated Facebook messenger..!! Hey, I thought there already was an attempt at a social networking phone. Oh yea, that was the famous MS “Kin”, lasted all of about 2 days. Apps that connect into social networks already exist on several platforms. Heck, even MS Outlook has an addin that shows contacts social status with every email sent and received. All we need is an “App for that” on the iPhone, would be cool to see a contacts social status either on calls or emails, incoming and outgoing. I hope Facebook isn’t actually dumb enough to build a phone. It makes no sense at all. The level of effort to build a mobile device, OS, and carrier agreements is not something that should be taken lightly. Facebook has enough to do with having an immense user population but no clear path to profitability. They need to stick to their knitting and just build better apps for existing mobile devices with greater integration with other platforms. Something they have not done a great job of so far. Facebook has a rare opportunity. It has built a static web experience that over 500 million subscribers use daily. Arguably, the popularity of the social network is based in the fact that Facebook controls the user experience. Is it such a stretch to think that a Facebook handset would not enjoy the same success? One — of the many — assets Facebook could employ on its socialphone is Places. An integration of Places and the socialphone could provide the company a laundry list possibilities — not to mention an additional source of revenue. One of those possibilities could be an automatic check-in/ping service. Let’s say the service pings you to a special deal at McDonald’s. It does this because you are a fan of McDonald’s. You get a discount code which is only available to McDonald’s fans. You walk over to a McDonald’s where you are auto-checked-in. This notifies your friends where you are. Your friends could join you and get the same discount because they are your friends. Then using a contactless payment system the discount is applied and your credit card is automatically charged. All of this would be opt-in; obviously. We see 500+ million registrations as a legit number, but NO mention of current daily, weekly or monthly Unique users? Which is not in Facebook’s DNA. They will never undertake “opt-in” structures. Their goal is to acquire data and sell it for more than the service they provide you with. If you cut off the flow of your data to them, you mean nothing to them. Yeah, Alexa has it at around 35 million a day, and the #2 site in the world behind only google. Pretty impressive, but still far from 500 million. If you go with daily page views though, you creep in on that 500 million number. Ultimately, any effort that focuses on staying directly adjacent to the user is a smart move for Facebook. That said, it is hard to say how far Facebook will need to go, in order to secure this degree of closeness in the mobile arena. Android’s openness to various ad platforms opens the door for Facebook to develop something robust that reinforces their experience, as opposed to Google’s, but that isn’t as much of an option with other OS’. A hardware partnership might be the way to go, even if only as an exploratory venture. The recent failure of the Kin illustrate the risks involved, but at least conceptually speaking, a “social phone” void still exists to be filled. They only said they’re not building a phone. Doesn’t mean they aren’t partnering with a phone manufacturer (or operator) to release Facebook branded/focused phones. A simple, non-technical, non-extensible phone that is absolutely wedded to Facebook services should sell well. Particularly to the 95% of Facebook users who don’t have/want/can’t afford an iPhone or other smart phone. I think it would be a great way for them to secure further brand allegiance. 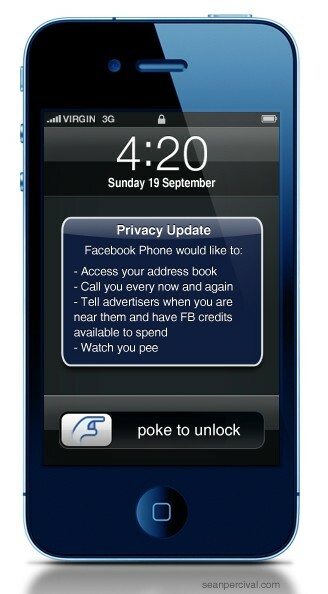 I for one, would welcome facebook mobile overlords. anything to break carrier control over my mobility. Curious – Why do you think Facebook would have any more success than Google/Android? So far, only Apple has given the carriers the finger. Right. Only Apple has stood up to the carriers. Which is why they are not yet on all the carriers. They are not about to roll over for Verizon like Google has. Witness Google being rolled by Verizon putting Bing search, apps etc on Android phones which is really not something Google wants or is good for the platform. Especially since it has been made to remove or change from Bing to Google services. Facebook would have to give out free phones and data plans (or, the 0.facebook no charge for data offer) to pre-teens and teens — hooking them the same way tobacco companies used to target kids, for this to work. Anyone who is an adult who thinks that giving Facebook access to the personal data on your cell phone is a good idea is an absolute idiot. Facebook is the epitome of a gated community. Hang out there too long, you think it’s the real world. It isn’t. Curious — why do you think that Facebook would have to give anything away for free? The handset will be subsidized by the carrier and the data plan will be of the carriers choice. This is not to say that Facebook will not have some influence. I think you are giving the company to much authority. The carriers have an incredible amount of leverage — the lions share of the equation. Facebook could easily customize and brand a phone without â€œbuildingâ€ it and also “selling” it themselves. I can see the college kids already camping out in front of AT&T and Verizon stores waiting to get the first Facebook phone. This disruption to the market reminds me more of the development and rollout of first iPhones and Droids. The question is how will the Androids and iPhones be able to compete with a second rate Facebook app and an OS without the Facebook apis? Google did not “create” Android. They bought it. Initially to compete with Windows Mobile which is why the first versions of Android looked like Windows Mobile. When iPhone became the clear leader they decided to copy the iPhone instead. Diversifying is usually a good idea, I agree, but Facebook branding or otherwise making any kind of mobile phone is a bad idea no matter how you look at it. What they should do as far as the mobile phones is start to take their applications a lot of more seriously again.